John DeCaro of All Ocean Yachts writes in to say that work is nearing completion on the new Luiz DeBasto designed 27.7m Inace 90 raised foredeck explorer megayacht. She was created to have the interior volume of a 32m yacht and, says John, has all the requirements for world cruising, with a range of 4,000 nautical miles. There's a large master on the main deck and three guest staterooms, two with Pullman berths, and all have full ensuite heads. There are quarters for four crew but it's anticipated that the vessel can be operated by a family with limited crew. The first series is being built with a steel hull and aluminium superstructure to RINA class and MCA small boat code, although John says that he's working with several yards to produce a GRP version. 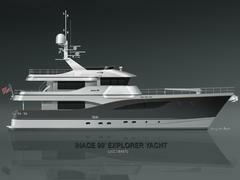 The price for a fully equipped vessel is set at $7.38 million.